256 pages | 23 B/W Illus. "Enter Culture, Exit Arts? is a meticulous, multi-method study that leverages comparisons across countries and over time to maximum effect. Through the comparison of trajectories of discourses on culture, the authors are able to make sense of large-scale cultural changes while also smartly pushing forward our understanding of numerous core issues in cultural sociology. The clear writing and organization of the book into thematic chapters will make it useful for both scholars and students." "This is a timely and pioneering contribution to cultural sociology, since many debates about the developments in classifications of cultural production and consumption are about change over time, but often without systematic longitudinal empirical analysis. The authors’ comparative analysis combines empirical solidity in describing and exploring the changes in detail with theoretical nuance in relating the empirical details to key sociological dynamics in the processes of ‘loosening’ the boundary between ‘highbrow’ and ‘popular’ cultural classifications." "Drawing on an impressive data collection, this book contributes to the cross-national study of how cultural classification systems have changed over time. 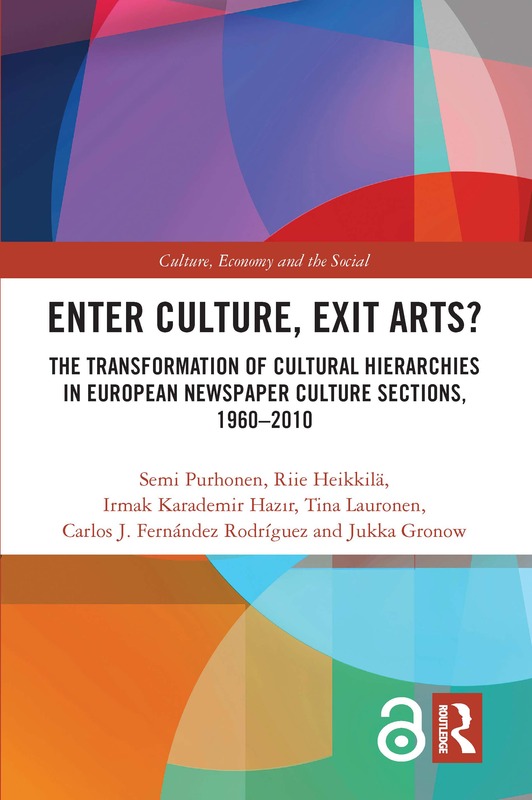 It is an excellent empirical study of transformations in the European cultural field in the past half-century that revisits important questions regarding artistic legitimation and cultural globalization, while also offering new directions for thinking about the evolution of cultural hierarchies." Semi Purhonen is Associate Professor of Sociology at the Faculty of Social Sciences, University of Tampere, Finland. Between 2013 and 2018, he worked as academy research fellow at the Academy of Finland and was the Director of the research project ‘Cultural Distinctions, Generations and Change’, which lays the ground for the present book. His research interests are in the fields of cultural sociology, consumption, lifestyles and social stratification; sociology of age, generation and social change; and comparative research and sociological theory. Riie Heikkilä is a postdoctoral researcher at the Faculty of Social Sciences at the University of Tampere, Finland. Her main research interests include cultural capital, cultural consumption and social stratification, and comparative sociology in general. Her research project ‘Understanding Cultural Disengagement in Contemporary Finland’ has funding from the Academy of Finland until 2020. Irmak Karademir Hazir is Senior Lecturer in Sociology at the Department of Social Sciences, Oxford Brookes University, UK. Her research focuses on topics such as taste, socio-cultural change, Bourdiesian analysis of Turkish consumption scene and embodiment. She has worked as a board member of the European Sociological Association, Consumption Research Network and International Sociological Association, Research Committee on the Body in the Social Sciences. Tina Lauronen is a PhD candidate at the Department of Social Research, the University of Helsinki, Finland. She has worked in the project ‘Cultural Distinctions, Generations and Change’ with a funding from Kone Foundation, and her dissertation focuses on the cultural globalization through the content analysis of the data from culture sections in quality European newspapers. Carlos J. Fernández Rodríguez is Senior Lecturer at the Department of Sociology of Universidad Autónoma de Madrid, Spain. His research interests are sociology of consumption, sociology of work and organizations, and industrial relations. He currently acts as the President of the Research Committee of Sociology of Consumption at the Spanish Federation of Sociology. Jukka Gronow is Professor Emeritus of Sociology at the Uppsala University, Sweden. His professional interests cover social theory, economic sociology and the sociology of consumption as well as the social and cultural history of the Soviet Union. His latest book is Fashion Meets Socialism: Fashion Industry in the Soviet Union after the Second World War (SKS 2015, co-authored with Sergey Zhuravlev).